Disclaimer: Due to a lengthy bout of rampant procrastination, combined with the afore-mentioned blockage and vactaioning, the details of this chapter is more than a little vague in my memory. Therefore I ask that you pardon any mistakes and omissions, and if you happened to be there you should pipe in. Note that certain liberties have been taken due to who will be playing in the next chapter. The following takes place between 20 Decanum and 28 Decanum, YE 1022. Having successfully cleared out the catacombs of Zalburg, the cabal, now without the steady urgings of Master van Zaar, decided that it was time for them to take a stab at the heart (brain might actually be more accurate) of the Ordo Ultima Thule: the good ship Pius is taken into the Void, where Bansl, now a Disciple of the Abyss, steers her deep into the eternal darkness. Some preparations were made before the heroes took to the stars, and there was a short debate as to whether they would strike at the moonbase or seek out Deep Command, a.k.a. Dr. Moerbius, aboard the mothership somewhere deep in the Argosphere. As they concluded that an assault on the moon, even with the Tower Helreginn having been destroyed, would likely prove to be very costly, and that success would not be certain, they decided to seek out the head of the OUT. As the Pius rounded the moon, Master Bansl again picked up the faint pilot-signal, emanating from somewhere deep in the darkness beyond. Using the OUT transiever he was able to follow the signal to the first buoy, and there locate the next one. Following the signals, he then led the ship deeper and deeper into empty space. Captain Galan, realizing that should they lose the signal, they would quickly becom lost in the vast emptiness, wove a Silver Cord back to the moon. Still, as they rounded buoy after buoy it became clear to the heroes that becoming truly lost in the Void was a danger that grew with every buoy passed. 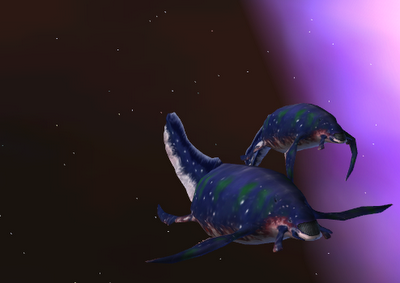 Of the wonders they encountered on this expedition, the Orca Galactica* deserves special mentioning. A school of these gentle giants approached the ship with curiosity, and after having been fed Mana, followed the Pius for days. The magicians discussed catching one of the space-whales, and in the end a young calf was indeed bound to the ship by Master Tito. Five days out from the moon, the Pius was suddenly shook by a great explosion. Shortly after, the cabal detected a large, cylindrical metal projectile, hurtling towards the ship -- aiming at where the explosion had occurred. Galan and Bansl cast their awareness outwards, but at first they could not find the enemy. They managed to pick up a faint signal from what they concluded must be an OUT Reaver. The space-whales, still following the ship, now panicked and fled, and the magicians used this commotion to cloak the Pius and thus make good their escape. A day later, the lookout spotted a large rock, lying like an island in the empty space. Shortly thereafter, more rocks were spotted, littering the Void like a vast archipelago. This place bore with it such an Echo that the magicians quickly realized its name: Saragossa. The next signal came from within, and so the Pius sailed in to the slow-moving, treacherous asteroid field. Here they encountered another Reaver, and this time they managed to destroy it before it could further damage their ship. When the Pius finally made it through the grinding rocks, she emerged into a vast, cavernous, starless hole in the Void; they had reached the Dead-space of Saragossa. Here the stars were blotted out by the surrounding asteroid-field, and the Echo bore witness of the death of a world. Magic here was greatly doused, but the might of the Pius Cabal still allowed them to find what they sought, the Ordo Ultima Thule Mother-class ship, EXODUS I. 10,000 miles into the Dead-space lay their target, a thousand-year old metal structure, large enough to carry with it the seeds of a civilization. Despite the anti-magic environment, and despite the Shardakeem-plating on EXODUS I's hull, the Masters managed to scry the interior of the Mother-ship. Following a transponder-array, Galan penetrated deep into the bowels of this beast, and following the name of their enemy, Dr. Mörbius, finally found an antechamber that lay close to his location. Here he was faced with some new devilry: Goethic-enhanced Awakened, entombed in sarcophagi of crystal and dark metals, their screams of blind rage and agony directed against the Awakened souls of anyone in range. The two Hellghasts standing guard in the chamber were quite literally upstaged by these blasphemous new enemies. Galan could not harm them, and so Bansl was teleported into the dragon's lair. The Hellghasts were quickly dealt with, and the Bombmaster also managed to place his explosives so as to destroy both the Sirens' sarcophagi. The death-wail of the Sirens cut Galan's connection to the antechamber, and Bansl is now alone aboard the Mother-ship. Storyteller's note: It is good to be back in the game gain. *Cookie to the first who can name the reference for the Orcus Galactica. Note: Orcus is a word for Death or the Underworld in Latin. So "Orcus Galactica" means something like "Galactic Death", or "Death Galaxy". The closest translation of Galactic Whale would be "Galactum Cetus"
As for the reference, maybe the Space Turtle of Discworld? Nope. Here's another derivation of orcus. The Image is another hint, although it was not my first choice - I couldn't find the one I really wanted to use. Yet another hint is Captain Flint.